I have very mixed feelings about this drama. I really liked the premise (similar to a J-Drama from a while back) and the set up was handled well if a tad bit melodramatic. The writer did an okay job of introducing all the people on the ship and getting the story underway. It became hit or miss based on the medical stories told in the episodes. 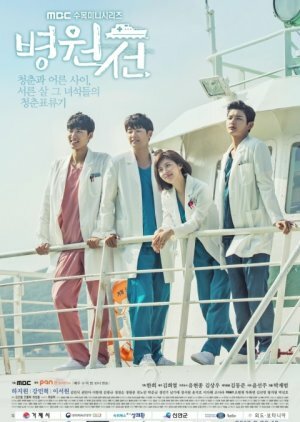 The major flaws are a reliance on tired tropes, an odd but thankfully short lived love triangle, an unnecessary addition of a messed up ex, over the top medical scenario (the teacher...you'll know it when you see it) that makes me dislike the female lead for a bit. Also, and no small thing, the drama is definitely too long. In addition, the writer didn't seem able to set a tone. A little medical, a little romance, a little comedy, a little melo, a little slice of life and so on. I'm not saying that can't work but this writer does not have the skills to pull it off. (Watch Doc Martin for that.) There seemed to be an effort to make it a little bit like every other successful medical drama that had come before instead of just making it his/her own. That's unfortunate. Also, if there is one thing I could tell drama writers who are doing a medical show, it is this: hospital politics are always boring. The writer stayed away until toward the end and it was just blah and I skipped as much as I could. I finally figured out that I liked the story more when they were on the ship, and it slowed down when they were in the local hospital. The ship is what makes this scenario unique. I stuck with the drama because I did like a lot of the first half of the drama even with some of the tropes. Unlike many who couldn't buy into the relationship between the two leads, I actually appreciated that it was low-key and sweet. I like that she was the surgeon and he the internal medicine doc and was a good guy. Normally in k-drama, he would be a jerk or tsundere or a genius surgeon. The age difference didn't bother me, because it didn't bother the characters as relayed by the actors. I also was fine with all the actors. I am middle of the road about HJW, but I liked her here and Kang Min Hyuk matched her low key character. Again, I do understand that many couldn't buy into their relationship, but this is what kept me in the drama until the end. Well, kind of until the end. I am doing the review but - full disclosure - I did fast forward through a lot of the last 5 hours of drama (though I did watch the last episode). So I would say that if you figure out early on that you can't buy into this relationship, drop because there is not enough other stuff to keep you going because the romance is somewhat secondary for a chunk of the drama. Overall, I think this was a missed opportunity by the writer. I kept thinking that I wanted to know more about what it was like on the Hospital Ship. What about storms? What happens if you date and break up and are stuck together? What happens when you get sick to death of one another? I get that it is a medical drama, but I would have liked to learned more about life on the ship and had some character development that way versus everyone and their dog associated with these people having some family/medical issue. Nonetheless, I did stick it out and I would give the first half a 7 and the second half a 6 so around 6.5. Problems others had: Medical scenarios aren't realistic. I love not being in the profession and not having to care but, yeah, I get it.